This province may be the second smallest in all Canada, but it’s sure to please with plenty or great RV parks and big fun. If you’re venturing to the small province of Nova Scotia, you may need to know where to go and where to stay. Lucky for you, we’ve done all the legwork to bring you our top five best RV parks and campgrounds for the beautiful maritime province of Nova Scotia, Canada’s ocean playground. Baddeck is one of the most popular campgrounds in all Nova Scotia and one of Good Sam Club’s top 100 RV parks in North America. A few nights there should illustrate why. You have both back-in and pull-through sites that can accommodate big rigs, and all those sites come outfitted with 30 or 50 amp electric, water, and sewer utility hookups. You don’t need to worry about getting nickel and dimed at Baddeck Cabot Trail Campground as wireless internet, showers, pets or pull through sites all come at no extra charge. Other top-rated facilities and features at Baddeck include a heated pool, playground, laundry facilities, nature trails, play fields and kayak and canoe rentals right from the park. You’ll find most of the fun of Baddeck right on the water. Popular services and attractions include North River Kayak Tours and Amoeba Sailing Tours. You can also try out Uisage Ban Falls, the Kidston Island Lighthouse, and the Alexander Graham Bell National Historic Site. Most on-the-water activities you can think of such as fishing, stand-up paddle boarding, kayaking and more can be found in the local Baddeck area. Many would consider this RV park and the campground a hidden gem, including us. The RV sites are right on the water, and you can choose a dry site, partial hookup site, or serviced site with water, electric and sewer utility connections. You also get the usual amenities to help keep everything clean and tidy including restrooms, hot showers, and laundry facilities. Other services and amenities at Old Shipyard Beach Campground include firewood, boat launches and help to find local activities to do. And there are a lot of great local activities. You are right on Fundy Bay, home of the world’s highest tides. Use the high tide to your advantage for fishing, kayaking, canoeing or any of your favorite on-the-water activities. Use the low tide to search the beaches for all sorts of marine critters. Spend a few hours gathering the history of the area at Advocate Harbour or get out to Cape Chignecto Provincial Park for park side fun. Other local areas of interest include the Joggins Fossil Cliffs and the Cape d’Or Lighthouse. This RV park has carved out its own 70 acres of relaxation, and you’re invited to take part in the fun. Wood Haven RV Park of Halifax is home to 137 sites with full-service utilities which include a choice of 15, 30 or 50-amp electrical service, so you don’t need to worry about bringing along adapters. This park also hosts clean restrooms, free showers, and two laundry facilities. Other than clean sites and wash facilities you also have a rec hall, game room, camp, and RV supply store, dump stations and nearby beaches. The nearby capital city of Halifax holds plenty of things to see and do. Some of the more popular activities are exploring the Halifax Public Gardens and taking a walk around the Halifax Waterfront Boardwalk. Other neat sites include the Maritime Museum of the Atlantic, the Halifax Citadel National Historic Site of Canada and Point Pleasant Park. There are also several touring organizations that can offer historical and cultural tours of Halifax, on both land and water. If you think all Canadian beaches are chilly, try the warm beaches of MacLeod’s Beach Campground. You have your choice of 15 or 30-amp electrical utilities on top of water and sewer connections. The sites are open or wooded, and you can get your fire pit at many of the sites. Like any decent RV park, you also have clean and bright showers, bathrooms and laundry facilities. You’ll get a camp store for groceries and camping supplies, firewood for your fire pit, and a rec hall and playground for the little ones. MacLeod’s focal point is found on the beach itself, right from the beach and campground you can get some on the water fun, beach walks and views of magnificent sunsets. Of course, you’ll go crazy if you stay at your site, but the local area has plenty more to offer. Within an hour’s drive, you’ll find the Cabot Trail, the Cape Mabou Hiking Trail, the pastoral town of Cheticamp and the Alexander Graham Bell Museum. When in doubt about things to do, hop on a boat for whale-watching or salmon fishing. MacLeod’s Beach Campground will make you feel like a regular old salt. If you’re planning activities around a National Park, you might as well just stay within the park. Well, that’s what you get when staying at Cape Breton Highland’s Broad Cove Campground. This campground hosts just under 200 campsites and 83 of those come outfitted with electric, water and sewer hookups and about half of that 83 come with their fire pits. You also get hot showers and restrooms to clean you up after your day’s adventure. The amenities don’t stop there as Broad Cove also contains an outdoor amphitheater, kitchen shelters, group pavilions, playgrounds and more. Cape Breton Highlands National Park is right on the Atlantic Ocean and full of plenty outdoor activities and fun. Some of the easiest ways to kill time will be hiking and biking the park’s many unique trails, but you can also add some adventure to an everyday hike at Cape Breton. Popular ways to see the park include ranger-guided hikes like the Skyline Sunset Hike, the Seeing in the Dark excursion at the Warren Lake Trail and Lantern Walk Through Time. Throw in ocean kayaking, fishing, geocaching, and you’ll find plenty of fun for the whole family at Cape Breton Highlands National Park. Nova Scotia is known for its whale-watching. Whether you've been before or not, consider chartering a trip into the Atlantic to get up close and personal with a variety of aquatic life you might not see at home. 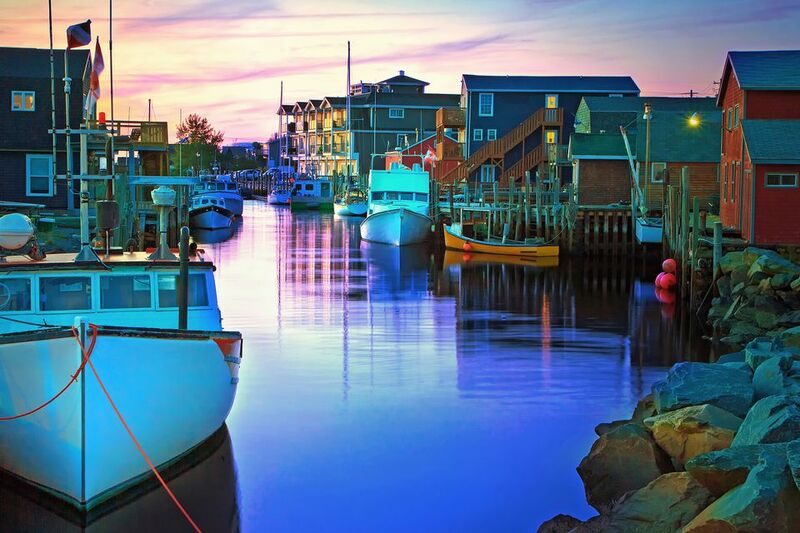 If you’re craving a maritime adventure and want to escape somewhere new, we recommend Nova Scotia. With plenty of great sites and great parks to stay at, we hope you’ll get your Nova Scotian adventure started soon. Is a 5-Star Hotel Really Worth It?